UCC Martial Law declaration 1980, transcribed below. 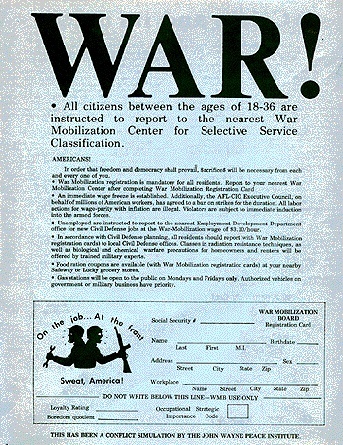 All citizens between the ages of 18-36 are instructed to report to the nearest War Mobilization Center for Selective Service Classification. In order that freedom and democracy shall prevail, $acrifice$ will be necessary from each and every one of you. War Mobilization registration is mandatory for all residents. Report to your nearest War Mobilization Center after completing War Mobilization Registration Card. An immediate wage freeze is established. Additionally, the AFL-CIO Executive Council, on behalf of millions of American workers, has agreed to a ban on strikes for the duration. All labor actions for wage-parity with inflation are illegal. Violators are subject to immediate induction into the armed forces. Unemployed are instructed to report to the nearest Employment Development Department office for new Civil Defense jobs at the War-Mobilization wage of $3.l0/hour. In accordance with Civil Defense planning, all residents should report (with War Mobilization registration cards) to local Civil Defense offices. 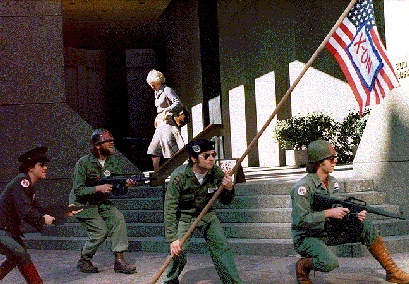 Classes in radiation resistance techniques, as well as biological and chemical warfare precautions for homeowners and renters will be offered by trained military experts. Food ration coupons are available (with War Mobilization registration cards) at your nearby Safeway or Lucky grocery stores. Gas stations will be open to the public on Mondays and Fridays only. Authorized vehicles on government or military business have priority.